So here is the story... There is a bakery here in Atlanta that sells a red velvet cookie with cream cheese frosting. Whenever I am remotely close - remotely close I said - I stop in and get that cookie. I don't even have to be hungry or have a taste for something sweet. I always stop in for that cookie. It.Is.That.Good. So earlier this week when my blogging pal, Victoria, e-mailed me about doing a virtual holiday cookie swap, this was the first cookie that came to mind. I have always wanted to make the cookie myself, so I researched a few recipes and settled on this one. And I'm so glad I did. 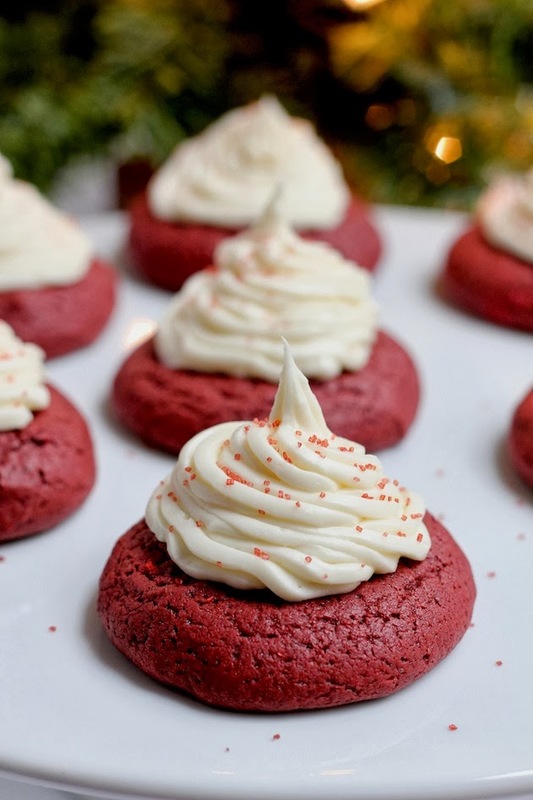 This cookie tastes JUST like a mini red velvet cake with cream cheese frosting. It's moist and soft, which is how I like my cookies. And that frosting - in addition to cream cheese, the frosting has white chocolate in it. I honestly don't love white chocolate, but it became a good foodie friend of mine when I tasted that frosting. The chocolate adds this richness to the frosting that I really love. 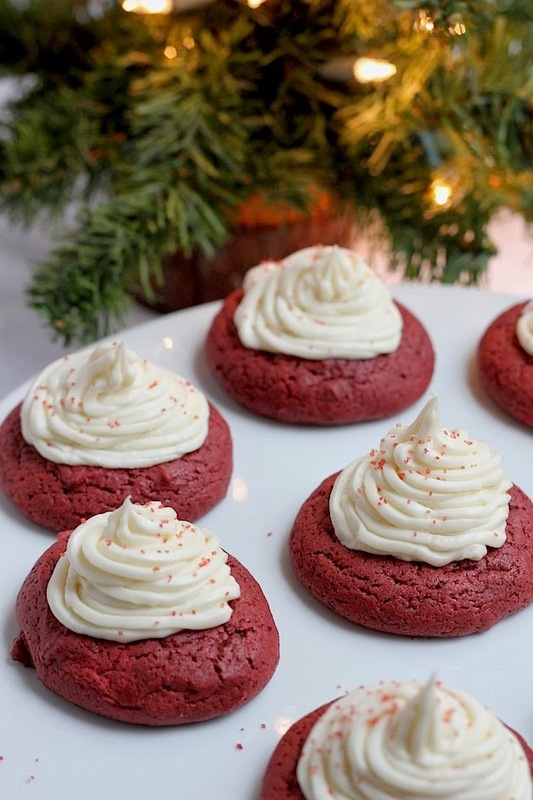 So my point is that if you love red velvet cake, moist cookies, regular chocolate, white chocolate and cream cheese all in one, then this cookie is worth a try. This cookie is part of a virtual cookie swap today hosted by Victoria of vmac + cheese! Nine other fabulous bloggers have posted some really good holiday cookies that are worth checking out! The recipe to my cookie along with links to theirs are below! 1. Preheat the oven to 375 degrees. Line 2 large cookie sheets with parchment paper. Set aside. 2. Melt the unsweetened chocolate using a double boiler or the microwave. Set aside to cool. 3. Using an electric mixer, cream the butter and brown sugar together. Add the egg and blend until the ingredients are well incorporated. 4. Add the evaporated milk and food coloring to a small bowl and stir. I used about a tablespoon of food coloring to get the color of those cookies. You can use more or less food coloring to get your desired color. 5. Add the flour, salt and baking soda to a small bowl. Stir until combined. 6. Add the dry ingredients and red evaporated milk alternately to the butter/sugar mixture. Start with flour and end with the flour. Be sure the ingredients are well incorporated, but don't overmix! 7. Add the melted chocolate to the batter and beat on low speed until fully incorporated. You could also stir in the chocolate chips at this point. I didn't add them to these cookies, but I wish I did! 8. Use a medium ice cream scoop to spoon the dough on the cookie sheets. 9. Bake for about 8-10 minutes. I wanted my cookies to have a soft, cakey texture so I baked my cookies for about 8.5 minutes. 10. Remove from oven. Use a spatula to carefully transfer the cookies from the cookie sheet to a cooling rack. 1. Melt the white chocolate over a double boiler or in the microwave using 30 second increments. Set aside to cool. 2. Cream the butter, cream cheese, vanilla and salt until creamy. 3. Slowly add the powdered sugar. Beat until smooth. 4. Add the white chocolate to the mixture and beat on low speed until incorporated. 5. Add the frosting to a pastry or zip lock bag and frost the cookies. Sprinkle the frosted cookies with red sugar. Here are the links to nine other holiday cookies! Be sure to check them out! I'm also linking up with Schue Love's Holiday Recipe Link Party! wow these look sinfully good! The photos are so beautiful!! And they look like little red velvet cakes! I bet you were the star of the party!!! I will certainly have to try your recipe ….. I have an upcoming party and this is certainly a show stopper! This looks pretty much like perfection. Red velvet + cream cheese is my favorite flavor combination of all time, I'm pretty sure. It's like Christmas in cookie format!! Fabulous job. These cookies look delicous. I would like to try one. SO pretty and I'm sure delish! Wish I had a few (dozen) right about now to get me through the day! Thanks for linking up! I just found your blog - it's lovely! I'm hosting a cookie baking day with two girls and we are going to try these! I made these and they tasted like absolutely nothing, even with the chocolate chips.... did you forget to list something possibly. I tossed all 3 dozen in the garbage. FYI.... I do have a great deal of experience baking cookies and double checked to make sure I did not omit anything. Sorry these did work out for you! They should definitely have flavor. All of the ingredients are there. 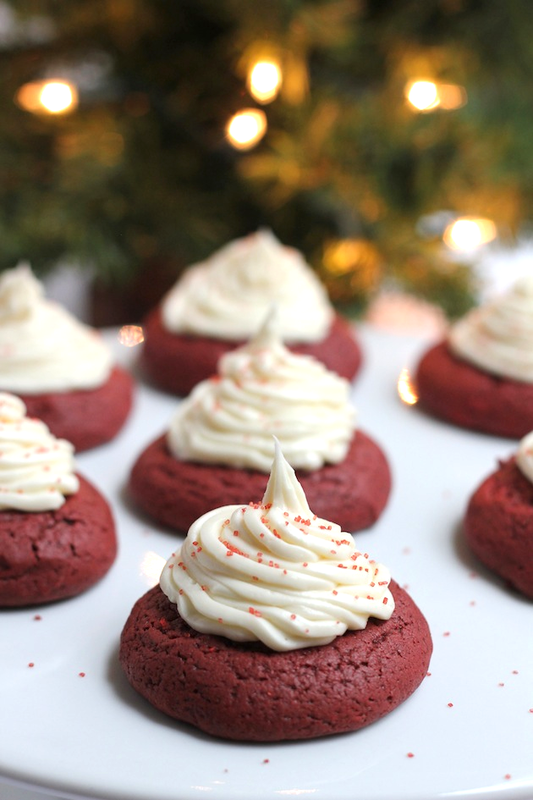 There are lots of other red velvet recipes out there to try! Happy Holidays! GIFT GUIDE FOR HIM: $100 OR LESS!